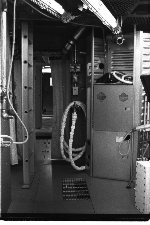 This is a view of the food freezer in one corner of the galley and displays of critical parameters visible through a view port. We didn’t have room in a 1-G facility to store all the food for 56 days. It was transferred in each day through a transfer lock.. The freezer box was something like an ‘ice chest’, but a very cold fluid was circulated through tubes in the walls to keep food frozen. ‘The Head' An ordinary balance weight scale is on the left. The wash basin is a little left of center above the white access door. The crew members were not supposed to collect water in the basin. Instead, they just wetted the wash cloths and took 'sponge' baths. Excess water collected in a tank behind the white door. The tank was isolated from the basin, pressurized, and dumped outside the chamber when full. There was a polished stainless steel mirror above the basin. Use of glass was restricted. Most of the equipment was stored after it was removed from the chamber. The sink was reused twenty years later during a test of a new CO2 removal system for the Shuttle. 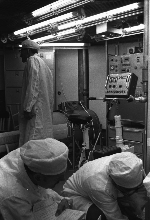 The chairs with fire retardent cushions, and the fire retardant mattresses were reused in the 80s to support the “overnight” prebreathe protocols for the Shuttle EVA astronaut EMU training. The horizantal cylindrical device is the LBNPD or Lower-Body Negative Pressure Device. Behind it is the exercycle – seat and control panel visible. To the right is the food pedestal (white). The pedestal was flight-like; it provide water for reconstituting dehydrated food and power for the food trays which used thermo-electric systems to heat or cool the food. In zero-G simple brackets attached to the pedestal kept the crew in place. We provided chairs for 1-G use. The ceiling was made to look a little bit like the second level in the Skylab. A comm. box is at the upper right. Look out of the main chamber toward the 'locks' and the entrance door in the far distance. The ladder for escaping from the second level is on the left. It could be raised or lowered easily. A fire hose and emergency switches are on the right side of the door. The shower stall, lights, LBNPD, and Exercycle are visible in the photo at the immediate left. The shower folded into the water collection pan at the bottom for storage. It consisted of a fire and water retardent fabric cylinder shaped by metal rings. When raised, it was supported by hooks in the ceiling. A hand-held nozzle was used to spray the water. The water was not recycled. Technicians at work in the chamber. Strict cleanliness was maintained. 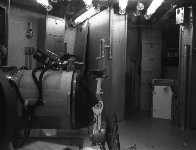 The exercyle is visible in the left photo and the techs in the right photo areworking in the galley plumbing up the water nozzles.in the food pedestal. 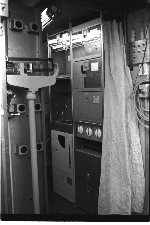 This photo is centered on the main emergency switch panel in the chamber. The electrical conduit dropping down from the top center terminates at the Fire Water Switches and the Fire Alarm Switch. Below the switches is a panel of valves and quick-disconnect (QD) connectors for oxygen masks. 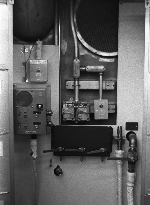 To the right of the oxygen panel is one of the many manually actuated water hoses. On the right is a comm box and above the box is either a 'Man Trapped' switch or the switch allowing closure of the transfer lock valve. The 'Man Trapped' Function - The man trapped switch actuated an alarm bell outside the chamber. It was a safety feature for pre-test operations. If the chamber door was closed and locked with a person inside the person could sound the alarm to be rescued to prevent being exposed to vacuum and dieing. 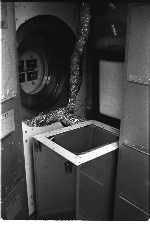 In addition to the ‘Man Trapped’ alarm, each chamber compartment had an altitude limiting valve that was always open until just before an actual chamber depressurization. Even with maximum vacuum pump operation, the air flow though the open valve would limit the chamber to a pressure no less than that at 10,000 feet altitude. A humorous incident with the ‘man trapped’ switch - One of the engineers was poking around in a chamber at closing time on a Friday. That chamber contained critical flight equipment and had to be locked when unattended. The Quality Assurance Inspector locked the door without making a careful check inside the chamber. The engineer thought that someone was just playing a trick on him so he waited a few minutes to see if they would be back to let him out. He soon realized that everyone would be going home soon, so he actuated the ‘Man Trapped’ alarm. Some of the techs scurried around trying to find the source of the alarm and figuring it was a false alarm they turned it off. The engineer turned it on again and they then realized that it was a real alarm and checked it out. By then the QA folks were gone with the key so the techs had to cut the cable lock with bolt cutters from the tool crib. was dirverted outside the chamber and then there were procedures to verify that the divert valves were back in the chamber flow position.